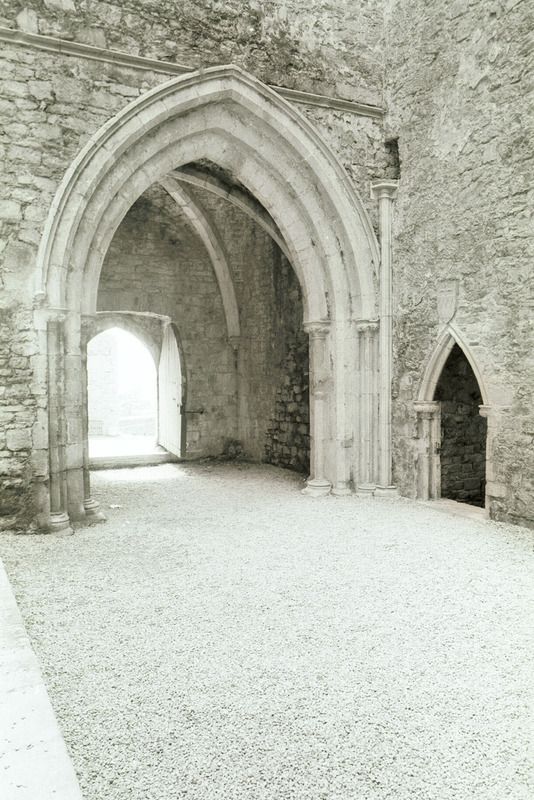 “St Patrick's Cathedral, Cashel, Co Tipperary, interior - nave, southern doorway,” Gothic Past, accessed April 20, 2019, http://gothicpast.com/items/show/1213. Photograph by Roger Stalley. View of doorway in south elevation of nave. Recessed chamfered arches are carried on filleted shafts with water - holding bases and head carved capitals surmounted by hood moulding terminating in a cranial label stop on the eastern side. The apex of the arch and hood moulding breaks through the stringcourse overhead. A doorway to the west tower is located adjacent to the southern portal showing foliate capitals and an heraldic shield over the apex of the pointed arch.